Seagate has announced Nytro 1000 and 5020 SSDs based on OEM'd Toshiba/Western Digital flash chips. The NAND supply for these 2.5-inch enterprise data centre drives has been secured through its $1.3bn participation in the Bain consortium deal to buy Toshiba Memory Corporation, which holds Toshiba's interest in the flash foundry joint venture with Western Digital. The new Nytros use TLC (3bits/cell) 64-layer 3D NAND chips and there are two product sets – the 1000 and 5020. There are two Nytro 1000s – the 1351 and 1551. They both have a 6Gbit/s SATA interface whereas the 5020 has an NVMe interface, being nominally part of Seagate's existing Nytro 5000 family of flash drives. 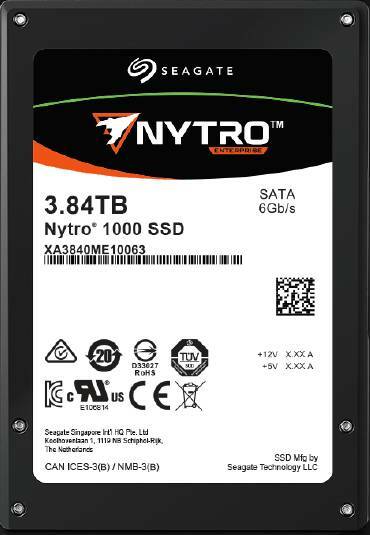 The Nytro 1000's capacity options are 240, 480, and 960GB, 1.9TB and 3.84TB. Seagate said the drives have a tuneable capacity feature that increases random write performance by up to 120 per cent or provides maximum capacity to the user. These drives include powerless protection and secure erase options. The difference between the two products is that the 1351 supports one drive write per day (DWPD) for its five-year warranty period, and the 1551, an endurance-optimised model, supports three DWPDs. Check out a data sheet here. Toshiba's SG6 is a 2.5-inch, 6Gbit/s SATA drive using TLC 64-layer flash. Its performance stats are up to 100,000/85,000 random read/write IOPS and up to 550/535MB/sec sequential read/write bandwidth.